Knowing how to sew fabrics meant for auto upholstery is vital to completing the project as planned and without frustration. Depending on the weight of the material, you can sew it with a commercial or industrial sewing machine or a personal sewing machine. Typically upholstery-grade fabric has a heavy weight, much heavier than that used for other textile applications, such as clothing or tablecloths. 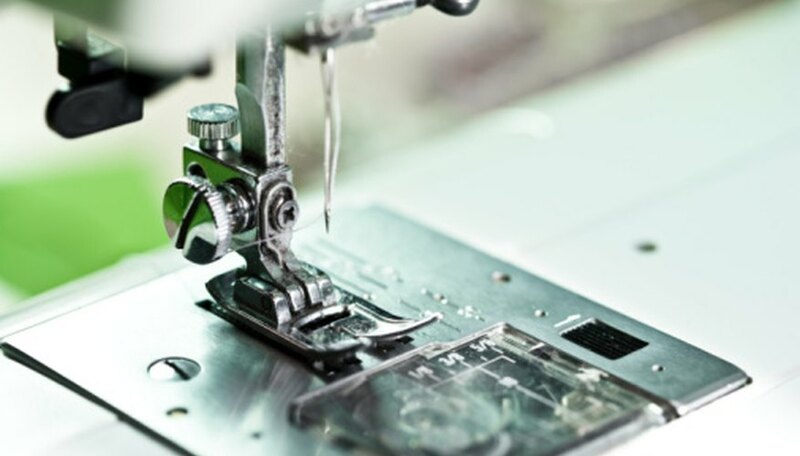 Industrial sewing machines are the best option for sewing upholstery-grade fabrics such as vinyl and leather because these machines are designed to handle thicker fabrics. Industrial machines use heavier upholstery thread and often sturdier needles which penetrate the material cleanly. However, industrial machines are expensive and are often out of the reach of the casual sewer. Heavy-duty personal sewing machines can handle sewing auto upholstery, depending on the power of the machine. A sewing machine designed for casual sewing and lightweight transportation will most likely not be able to handle auto upholstery. Many auto restorer hobbyists invest in older machines from established companies that were made in the 1940s and 1950s because the machines from that era tended to be bulkier and more durable, which makes them ideal to work with auto upholstery fabrics. Proper accessories make sewing auto upholstery an easier process. One item to acquire for your sewing machine is a welt foot, which allows you to sew welt, often called cording, easily. It is possible to sew welt with a zipper foot but the process is much simpler and better completed with a welt foot. If your machine does not come equipped with a welt foot, you may be able to purchase one separately from the manufacturer's website or a sewing specialty store. When working with vinyl upholstery fabric, keep the fabric warm. Cold vinyl is not pliable, which makes it difficult to worth with. Also, when sewing welt on corners, snip the corner fabric so that the machine rounds the corner with a little give. If you make an error in sewing vinyl and need to remove the thread, the vinyl will be left with small holes from the needles. To lessen the impact these holes have on the material, heat the area slightly with a hair dryer and rub the vinyl so that the holes close.